I don’t know if food stamps should be accepted at restaurants, but what I DO know is that people that don’t even know you shouldn’t be allowed to make decisions about what’s best for you and your family. This is great: love it. I have not experienced domestic by way of a partner – just my father, but otherwise as a parent single, first time parent – my gosh, I can fully relate to how vulnerable you would feel. I agree also that food stamps should be useable at restaurants – but I do believe restaurants should be recompensed by the government PROPERLY as they are not a charity. I admire you ENORMOUSLY to leave that relationship. My father left me no self esteem, and self-loathing. So to imagine that’s how your husband had you feel: congratulations. food stamps should be accepted in restaurants. you speak your mind as experience has made you today. I would say yes but only for food, not alcohol. I can’t imagine many people on food stamps would use them at a restaurant, though, just knowing how little money you get with them. I do not believe in federal food stamps or welfare of any kind. I believe first you get help from your family – your parents, siblings, aunts, uncles, and cousins. It is these kinds of trials that should draw a family closer. If you have no family or if they’re unwilling to help (which would be pretty pathetic), then you go to your friends. It is these kinds of trials that should draw true friends closer. If your trial reveals that you have no true friends, then you go to your church. Those who follow Christ, He charges with caring for the poor and helpless. They will help you. If they don’t (thereby revealing that they don’t really follow Christ), or if you have no church or are an atheist and want no part of Christ, then I think you’re entitled to beg from strangers like me. First, exhaust your personal sources of help before you impose upon strangers. Do all you can to give people who know and love you the opportunity to do just that…love you. In this way, you help love abound and strengthen relationships. Also, it reveals the character of your husband to those he knows, and may shame him to a better way, though probably not. Only when you exhaust your avenues of love, THEN go to strangers (the government), if you have no other options. It’s a rare person indeed who has no family, friends, or church. I commend you for leaving a violent situation. I know how difficult it is for women in that situation to leave. In my experience, circumstances have to be pretty darn horrific to force a woman to leave. It is a awful kind of evil a man harbors in himself, if he can hurt and abandon his family. And I say that right: HE left you, you didn’t leave him. I pray he might repent of his evil, but I pray more for the safety and soundness of you and your child in the days ahead. Good luck. –And as far as a church, the though it nice but they can also only assist so much and for so long. Therefore, we should be careful using the statement: “It’s a rare person indeed who has no family, friends, or church.” It is not rare. In fact, it might be more common that we wish to believe. Maybe not in your community, but there are many that do experience this – lacking the true meaning of “community’ of course. I wonder if people might be skeptical of those using government assistance, whether as a first choice or last choice, because of those who might abuse it? So then the question is -should punish all for those few? I don’t think the “church” (in quotes because it goes by different names depending on faith) would agree to this approach. This is time where we need to have faith that those who need, really need and will not abuse it. Not a blind faith of course, because unfortunately there are those that will take advantage. It is one reason why the government tries to put safe guards into place, although they are not perfect of course. but again, do we make bold statements and approaches based on those few? People go down many paths during life and we should not assume they have, or do not have, resources. If you find it hard to believe, ask yourself if you have facts to this or if it is based on your personal experience. If it is based on your personal experience, you are blessed and hopefully recognize this fact. Living in the UK food stamps are a bit alien for me but I get the concept. I think what frustrates people who are against using them in restaurants is the notion of restaurants being fancy places that are a treat. Again, UK here but as far as I know you can slap the word ‘restaurant’ on a burger store as long as you have seating. People need a hot meal. And if these are temporary solutions till a person is financially sorted what is the problem with letting it be? The problem comes down to money and how much we are willing to spend on others and at times, this notion of ‘do they deserve it’. Perhaps more faith and less judging. We musn’t be so harsh on the people we are apparently trying to help. After all you have had to forego to ensure you and your child can live your lives to the best you can do, does it really matter what other people think. 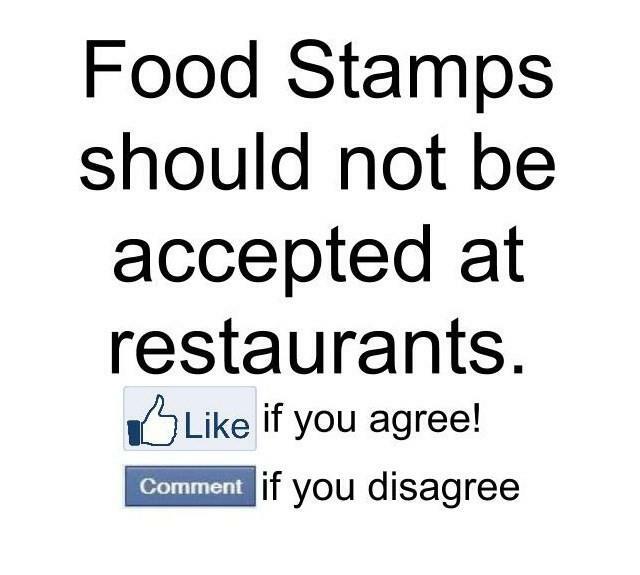 If the criteria allows food stamps to be used at restaurants, who are others to disagree. The choice should be up to the individual concerned. Personally, I do not care to eat out and only do so, when there is no alternative, mainly when I am away from home. In fact, I cook a main evening meal 7 days a week for myself, my wife and our adult disabled daughter. Our daughter has severe learning difficulties and insists on a cooked meal each evening, containing boiled white rice, freshly cooked meat (chicken or fish mainly) and a selection of freshly cooked vegetables. Do what you wish, it is after all your and your childs life and should be of no concern to anyone else. We don’t have food stamps in England, so it is hard to compare. However, giving it some thought and reflection, I feel certain that they SHOULD be accepted. You then get the chance to behave like everyone else, short of money, or not. You can go for treats, use the facilities when you don’t have them at home, and just get a break from the everyday routine. My only worry is that the staff might marginalise customers presenting food stamps to pay the bill, but what the hell? Well done in keeping going. Your blog is always inspirational. Regards from England, and my best wishes to you. Pete. Having been a struggling single parent without cooking facilities that would’ve been at least one meal for me instead of doing the dishes for the people I lived with but wasn’t allowed to eat with. Food stamps are a resource given to people who are in need. Let the recipient use the food stamps for food from a grocery store or food from a restaurant. It’s up to the recipient to manage how the money is spent (on food, that is). So, yes, I think that food stamps should be allowed to be used in restaurants on food. It’s rare that a situation operates in the black and white. As described my immediate reaction is yes. In contrast have heard of circumstances in another country where financial support has been used to purchase cigarettes while children go hungry. It’s a grey world we live in sometimes. Hello, this weekend is pleasant in favor of me, because this occasion i am reading this wonderful educational article here at my home. Most definitely they should be. People need to understand that others need a helping hand every now and again. Unfortunately, people are pretty blinkered to others, and prefer to just believe the comfortable lies that those who are struggling are lazy and don’t deserve help. Kudos to you for having the presence of will to say this. I agree. Due to events that were out of my control, my husband is no longer able to work. While we wait to get disability, we have had to rely on food stamps. I agree that food stamps should be able to be used in restaurants. While I am not homeless, there have been plenty of times that we were without power. If we could have spent money at one of the restaurants down the road that had power, we could have eaten a good meal or two. Instead, we were eating sandwiches over and over. It would have been a nice change to have something else. I think it should be even more so available to those who are homeless, or maybe disabled and it’s harder to cook for themselves. It’s amazing how many people don’t think before they “like” something like that. They think that because they aren’t on that program, it is beneath them. Well my husband worked for years and years paying into that system. We deserve the help that we are getting now. It’s nice to have that when you need it. And one of our friends who scoff at that need, may be there themselves one day. Lord willing, they won’t have to experience that. If people need help, let them ask for help from people instead of receiving bribes for their votes from the government. Before welfare and food stamps, people were for the most part loathe to ask for help. The situation needed to be pretty darn desperate for them to ask for help. And if they DID receive some kind of help, they wanted to work for it or pay it back. Not so today. People feel they have a RIGHT to “free” help. They’re ENTITLED to it. They DESERVE it. And they’re more than happy to vote for the gangsters who force those who work to give their wages to those who don’t in the interest of their brand of “fairness”. Are we really to the point where the “needy” feel justified to complain about the variety and type of food they receive free of charge? “…we were eating sandwiches over and over. It would have been a nice change to have something else.” Sheesh…and you wonder that someone might scoff at your “need”. And by the way, I myself “eat sandwiches over and over”, and I’m not on food stamps. If I want something else, I work, earn money, and pay for it. Maybe you should try that. You say your husband can’t work; what about you? You really can’t work yourself? Do you have any parents or children or relatives? How about them showing you some love during this difficult time? In the past, people would’ve been ashamed to allow a member of their family to go on the dole. My parents are in their eighties and not on welfare…no way they’re going to be in any kind of need while I and my siblings live. Plus they have siblings, and friends, and a church, and various organizations that they belong to that will help in a jam. I stand by my intial post: it’s a rare person that has no family, friends, church…NOBODY that will help them. In my experience, the vast majority of the people who are REALLY in that situation typically spent a large portion of their lives alienating people through drug or alcohol use, criminality, or other vices. A smaller portion are mentally ill.
No, there’s plenty of help in America without the government for those that really need it. What’s missing is the humility to ask for it, and the gratitude to see it as a sacrificial gift rather than a deserved entitlement. I have found that an even bigger controversy is over whether food stamps should be able to be used in convenience stores. I guess it just offends some people who work hard and have to make choices to avoid buying conveniences like sodas, snacks, and fast food in order to make ends meet when they see people in convenience stores using government assistance to load up on sodas and candy bars. I agree that government assistance can be a lifesaver for families like yours but I also see how it is abused by many people who are generational welfare recipients. I think that there should be limits put on some programs and there should be more education and training made accessable to those who are down on their luck to promote independence and self sufficiency. I admire you for leaving a dangerous situation and giving your daughter a healthy environment to grow up in. This is how government assistance should be used. I do wonder how eating out and frequenting convenience stores could be a good choice for a person on a very limited income. I know that it costs my family of three almost $20 to go to McDonalds and funds don’t go very far at those prices but as an occasional treat I say that they should be accepted at restaurants. Well stated.. Thanks for sharing your perspective! It’s amazing how opinionated people are towards what the less fortunate should receive, when they have never been in that position or know the reasons behind things.